The Cleveland area is home to 120 or so different ethnic groups - each bringing their unique customs, costumes, music, religion, art, food and so on. We believe that our community is richer because of the ethnic diversity we have and that it could be even better if we promoted and celebrated the cultures more. We are firm believers of the tossed salad model, where unique cultures are maintained and celebrated as we all live in the same big bowl, rather than the melting pot where all are supposed to blend into a homogenous mass. At ClevelandPeople.Com we work to promote and celebrate the various ethnic and cultural people and events we have in our city. By documenting (with text, video and pictures) the numerous ethnic and cultural events we are compiling an archive of this activity that makes Cleveland so unique. This short video clip from Ken Kovach, Chairman of the Board of the International Services Center, at World Refugee Day in June 2012, speaks to this fact. Cleveland Councilman Joe Cimperman recognized ClevelandPeople.Com as "being everywhere" in this tribute at the 2012 Slovenian Statehood Day in Cleveland City Hall. We also see how Cleveland's population is shrinking. Realistically, we don't expect to see a mass influx of residents from the suburbs returning to the city. We believe that Cleveland can grow by attracting, welcoming and retaining immigrants from all over the world. And that's where ClevelandPeople.com comes in. In our short existence we have attracted thousands of visitors each and every day. About one half of the visitors are from the Cleveland area. We hope that besides checking on their own culture that they investigate some of the other cultures as well. One quarter is from the US but outside Northeast Ohio and the other quarter is from outside the United States. Frankly we were surprised at the number of e-mails we began receiving from people all over the world who are now interested in Cleveland because they found us on the web. Here are a few sample e-mails that have come in. We get e-mails like this every single day and have become a Virtual Welcome Center for the city. An oral surgeon from India considering a faculty position at CWRU asked us about the city and the local Indian community. A native Hungarian has been living in the USA for 8 years said, "I was glad to discover this site and want to come to Cleveland and get to know more Hungarians in the area." "My husband's family is of Lithuanian descent. I hear that there is a Lithuanian festival held each year in Cleveland. If so, please let me know when it is as we may be able to visit and attend sometime." And more like that every day! These examples demonstrate the demand and possibilities for a site such as ClevelandPeople.com. Obviously, we cannot know every community as well as the passionate members of that group. So we established our Ambassador program. Passionate and outstanding representatives of each community are being designated as Ambassadors so they can make sure we have the most accurate and current information on their community. We are also working with schools, universities and businesses to increase global knowledge and business. Our Calendar of Events is a one-stop place to learn about the events of all of our region's groups. In 2010 we started the Cleveland International Hall of Fame to recognize the pioneers in Cleveland ethnic communities and to encourage a new generation of volunteers and leaders. 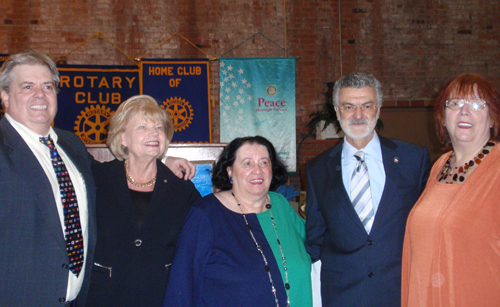 ClevelandPeople.Com has been recognized by many groups including the Rotary Club of Cleveland who presented their International Service Award to Dan Hanson, Debbie Hanson and Pat Hanson of ClevelandPeople.Com. 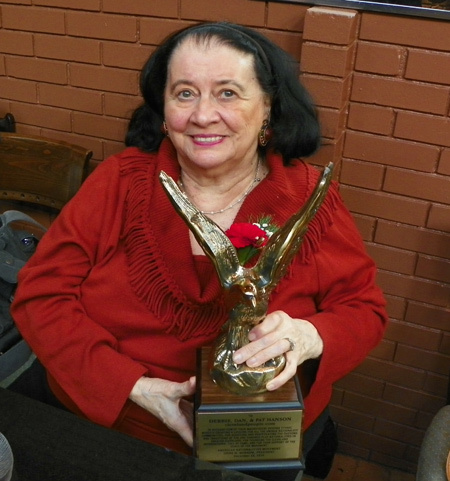 ClevelandPeople.Com was also honored by the American Nationalities Movement with their Freedom Award. Cleveland Mayor Frank Jackson hosted an event at the Rock and Roll Hall of Fame and Museum in Cleveland Ohio for the Cleveland Consular Corps (leaders representing various countries) and Dan Hanson and Debbie Hanson of ClevelandPeople.Com. The Mayor singled out Dan Hanson, his sister Debbie and their mother Pat Hanson as being there for every international event in Cleveland and archiving all the ethnic and international activities in the city. 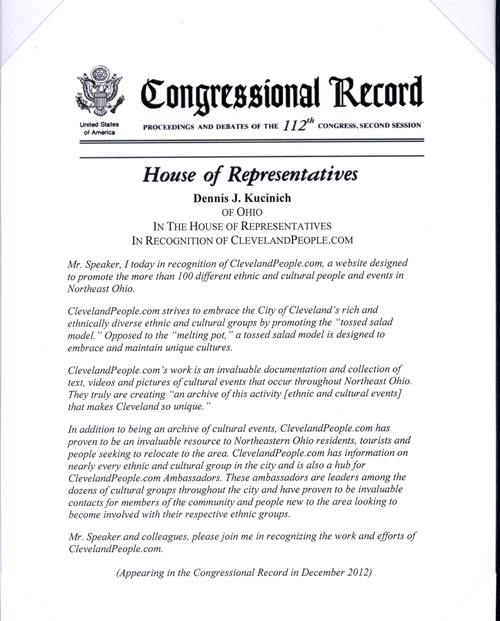 Thank you to Congressman Dennis Kucinich for recognizing ClevelandPeople.Com into the US Congressional Record. 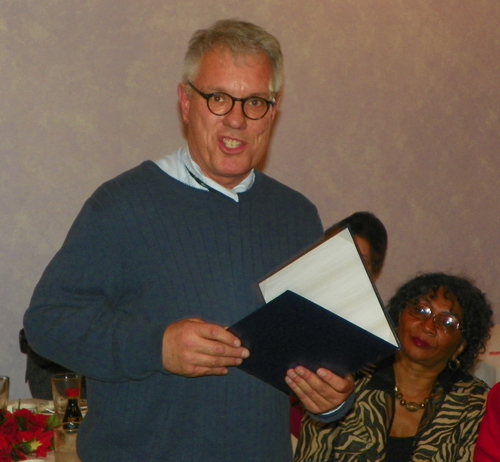 Michael Patterson from Congressman Kucinich's office presented the proclamation at a holiday event. As many have said, if it has something to do with Cleveland and our ethnic community, ClevelandPeople.Com will be there. Please contact us with your questions and ideas. We appreciate the recognitions and will continue to work tirelessly toward fulfilling our mission. Let us know if you want to help.